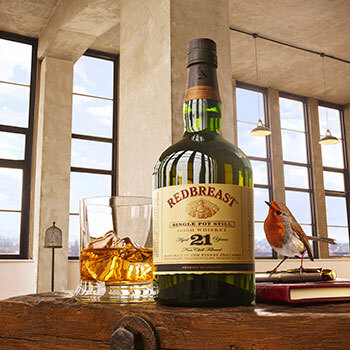 Irish Distillers Pernod Ricard has added a Redbreast 21 Year Old to its range of Irish single pot still whiskeys, the ninth in the company’s range. Continuing in the Redbreast signature style, Redbreast 21 Year Old has been made from a mash of malted and unmalted barley, tripled distilledin copper pot stills and aged in a combination of first-fill oloroso Sherry casks and first-fill Bourbon casks. Bottled at 46% abv and non-chill filtered, the edition is available in “very small” quantities, but will be rolled out in the UK, Ireland and continental Europe (by La Maison du Whisky) this week. The whisky is described by Irish Distillers as full-bodied with notes of rich dried fruit on the nose with soft vanilla, Sherry nuttiness and fresh fruit nots in a creamy mouthfeel on the palate. The last Redbreast Irish single pot still whiskey to launch was the Redbreast 15 Year Old in 2007. The 21 Year Old now joins that expression, along with the Redbreast 12 Year Old and 12 Year Old Cask Strength in the range. Redbreast 21 Year Old is available this week at an RRP of €180 for a 700ml bottle. It will be rolled out to the US early next year.